Upon arrival, meet your guide and transfer to your hotel. Enjoy a welcome dinner at a fine local restaurant. Overnight at hotel. Begin the day with a visit to Gandan Monastery, the seat of Buddhism in Mongolia. Here, you will learn about Mongolia’s Buddhist heritage. Next, drive to the Hustai Nuruu National Park to explore world’s only true wild horse, takhi. Overnight in gers. In the morning, we will transfer to the airport for our morning flight to the Lake Hovsgol. Upon arrival, meet your guide and transfer to the lake. Overnight in gers. After breakfast, enjoy a full day of horseback riding along the lakeshore. 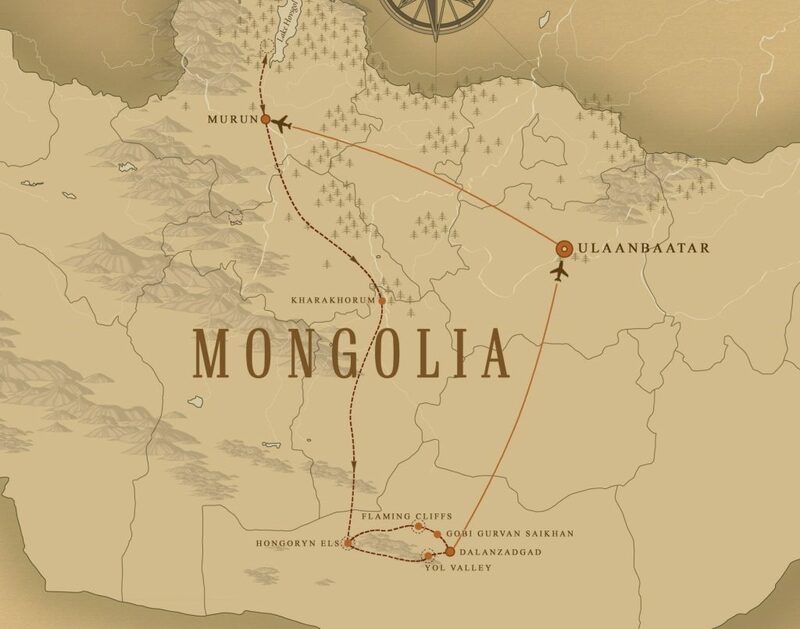 We will start riding south and return to the camp from its northern direction by making a large loop. Overnight in gers. In the morning, we will begin our journey driving back to Ulaanbaatar. Overnight at hotel. After breakfast, transfer to the airport for your departure south to the Gobi desert. In the afternoon, drive to the Yol Valley located in the Gobi Gurvan Saikhan National Park. Overnight in gers. In the morning, explore the Havtsgait Petroglyphs, an amazing collection of early Bronze Age rock carvings located on the top of a mountain. In the evening, we will drive to the Flaming Cliffs, red sandstone bluffs stretching about 3 km in wide, where hundreds of dinosaur fossils have been found. Overnight in gers. In the morning, we will transfer to the airport for our return flight back to Ulaanbaatar for our last day of exploration. Overnight at hotel. After breakfast, transfer to the airport for departure. Experience and share Mongolia’s most popular holiday. 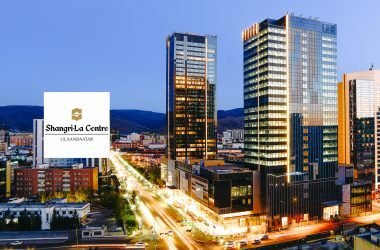 Hotel Shangri-La Ulaanbaatar is conveniently located in downtown Ulaanbaatar and is a 5 start hotel with a friendly staff. All major atractions of UB are located with a walking distance of the hotel. 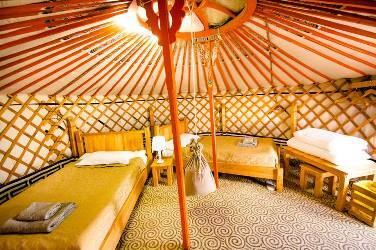 Throughout the most part of your itinerary, you will stay at tourist standard ger camp, rustic, eco lodges. Most past travelers said ger camp experiences are pleasant and one of the most memorable part of the travelers. 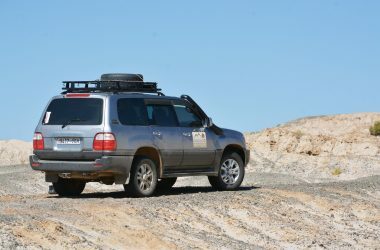 Land transportation is provided by Toyota Land Cruiser jeeps seating 3 passangers per vehicle. Some roads can be bumby and hard but our drivers are some of the most experienced and reliable in the country.